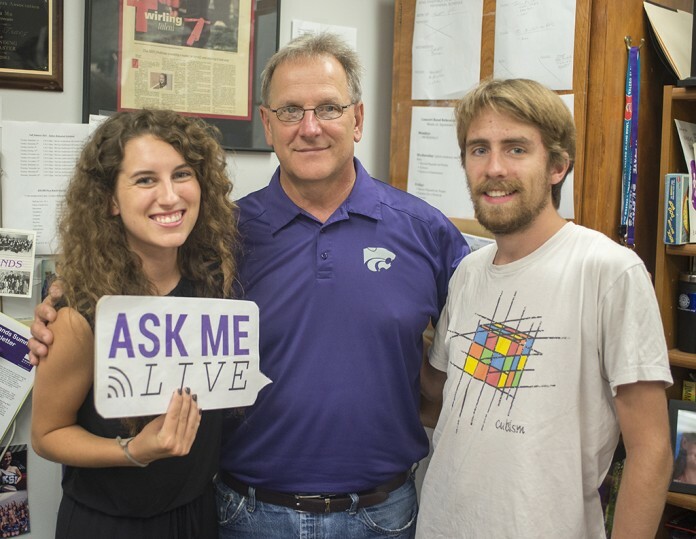 Ask Me Live host Erin Poppe, graduate student in public administration and online editor for The Collegian, Dr. Frank Tracz, director of bands at K-State, and Parker Robb, senior in chemical engineering and transcriber for The Collegian, stand in Tracz's office after the #AML on Sept. 9, 2015. The Pride of Wildcat Land came under national spotlight overnight, after a halftime performance at last Saturday’s football game against South Dakota had many seeing a lewd scene involving University of Kansas’ Jayhawk mascot and a misshapen Starship Enterprise from Star Trek. 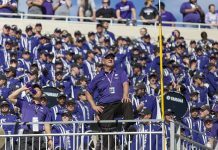 In light of the event, the Kansas State Collegian hosted an Ask Me Live session with Director of Bands Dr. Frank Tracz on Wednesday, Sept. 9. We’re sorry if Tracz didn’t get to your question in time, but check back later as we will have more guests throughout the year! Please refer to the #AML FAQ if you have any more questions. K-State Director of Bands Dr. Frank Tracz is recognized as one of the best band directors and music educators in the nation. Since joining the university in 1993, Tracz has coordinated the undergraduate and graduate conducting programs, taught classes in music education, and researched and developed the university’s master of music education program. In addition to his directing and educating duties, Tracz has increased K-State’s Marching Band membership to more than 300 as well as annually organizes several camps and clinics for young musicians and high school bands in the region, including Band Day and the annual Central States Marching Festival. First formed by professor Alexander Brown in 1887, the K-State Marching Band (also known as “the Pride of the Wildcat Land”) is an integral part of our community and has a rich history of recognition and support at every level: public school directors and students, the K-State student body, faculty, coaches, K-State’s Athletic Department and president, as well as state and local governments. The Pride consists of 400+ student woodwinds, brass, percussion, color guard, dancers and twirlers. 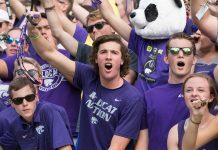 Membership is open to all K-State students, regardless of major, with some members receiving scholarship aid. Band members come from schools throughout the state and from across the nations with diverse educational goals and backgrounds. 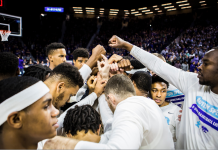 The students, which represent every college on campus and nearly every curriculum, work many hours a week in rehearsal during the marching season. UPDATE (4:45 p.m., Sept. 8): Dr. Tracz’s Ask Me Live will proceed Wednesday, Sept. 9 from 11 a.m. to 12 p.m.
UPDATE (7:15 p.m., Sept. 7): Information regarding Dr. Tracz’s Ask Me Live will be available tomorrow. Stay tuned. UPDATE (10:30 a.m., Sept. 7): See our article “University administrators silence Tracz” for more information. UPDATE (9 a.m., Sept. 7): This morning’s Ask Me Live session with Dr. Frank Tracz has been postponed pending a conversation with university administrators. We will post updates regarding any rescheduling as we know more. Thank you for your patience.